With Books and Bricks by Suzanne Slade is a beautifully written biography of an important historical figure whose life story is not nearly as well-known as it should be. Delicately illustrated by Nicole Tadgell, the book chronicles Booker T. Washington’s evolution from enslaved biracial boy to dedicated educator and leader. Washington was nine when the Civil War ended and all slaves were freed. But, as Slade writes, “Booker didn’t feel free. He had to work long hours in a salt mine so his family could survive.” Having been drawn to books as a child, he begs his mother to get him a book “And somehow, as often happens with mothers, a miracle appeared,” in the form of a spelling book. 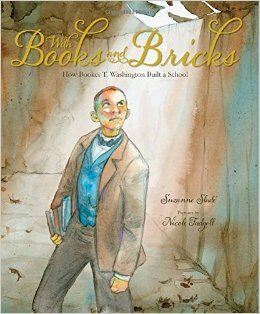 With Books and Bricks chronicles Booker’s herculean efforts to build a school building. He borrows money to buy a farm then teaches himself how to make bricks with clay that he and the students dig themselves. The kiln breaks three times, and tens of thousands of bricks are molded and then ruined before they finally succeed. There seems to be no modern corollary to this type of persistence. It’s an inspiring story of triumph over adversity told in a way that is deeply moving, and never overly sentimental. The story doesn’t underplay slavery nor does it paint the Civil War as the triumphant victory for enslaved people that many history books do. Instead, Slade manages to tell the story in a clear, straightforward way that will resonate with children not only because of the riveting story, but also because of its sheer authenticity. By omilaju in African American Child, Black Child, Boy Protagonist, Difficult National History, Emancipation, Mixed biracial Black White, Reconstruction Era, Slavery on April 1, 2015 .